Astrologically, Monday, Moon is in Ketu star Mercury sub. 3RD house cusp also in Ketu star, mercury sub. Ketu is in Mercury star and signifies 12.Mercury is in Mars star and so weak. Mars is involved in a triangular aspect with Neptune and Moon. Both Neptune and Moon are known for vagueness and vacillation. This reduces the power of Mars also. So Nifty may drift down, till noon. After that she may consolidate and go up, but not very significantly. On September 23,2014, third cusp is ruled by Venus. Moon is in Venus-Saturn.Venus and Saturn have a sextile relationship. Saturn is in Libra, ruled by Venus. Venus signifies 11 and Saturn 10. This may be a positive day.Profit taking may emerge after 3 pm. On September 24,3rd cusp is ruled by Venus in 11th. Moon is in Sun which is also signifying 11th.Positive moves may continue. This is a New Moon day, which is exact at 11:43:39 am, during market hours. At the time of New Moon, both Sun and Moon are in Ketu sub, which signifies 11th. 3rd Cuspal sub lord is Venus then signifying 10th. On September 25, 2014, 3rd cusp is ruled by Venus signifying 11th. But Venus has just moved into Virgo and so is not powerful. Also Virgo is her fall house. So 11th signification is not very strong. Moon is in Moon star and very close to 12th cusp. So Moon signifies 12. Her Cuspal sub lord Mercury also signifies 12.Also Moon is in square aspect with Pluto. So this could be a turn day, where positivity bleeds off. Also today, Venus, Sun, Moon and Rahu are all crowded into Virgo and have Ketu and Uranus, linked from the 7th.This makes their energies work in cross purposes. Jupiter Uranus waxing trine is exact today. So hereafter the positivity shall start waning away. Watch the trading days, 5 to 7 now. 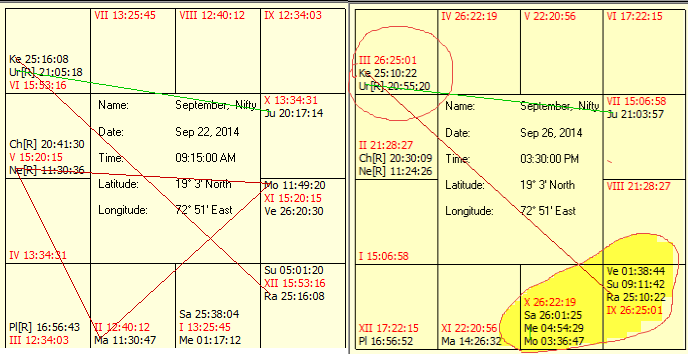 On September 26, 2014, 3rd cusp is in Venus star, Moon sub. Moon is not very strong, having just entered Libra.Moon is in Mars star. So are Mercury and Rahu. Both have strong 12th connections. So Moon may indicate 12 today. So, for me, this week should be positive overall. However, in the first week of October, Mars is going to join Uranus first and then Jupiter in a trine formation. Sun will square Pluto as well. Mars will also engage Chiron in a square. So this is the time zone where the current uptrend could make a spectacular up-move and then reverse to begin a meaningful correction and show some cooling off. As can be seen in the chart above, there is crowding of planets around the Rahu Ketu axis. Whenever planets pass the axis they get destabilised by Rahu. When several planets get destabilised then the effect could be bigger. This may manifest from September 29 onwards, into October second week. Hi Suresh - does this mean that we can expect a rise till 26th Sept and then a fall from 29th Sept into Oct 2nd week? or do we expect to see a further upmove in 1st week of Oct? There are two events at work here. 1. Jupiter Uranus trine. This gets exact on September 25. Now aspects of slow planets do not show immediate results. So we will have a time lag. Normally it will 5 to 8 trading days. It may also coincide with some lunar event.like New Moon, Full Moon etc.,Here we have a. New Moon on 24th b. Moon declination on Oct 01 c.Maximum Latitude on October 02. Since October 2 and 3 are holidays, there could be some correction on October 01. On October 03, Mars forms a trine with Uranus. In Sayana astrology, Mars and Uranus are in fire signs, Sagittarius and Aries. Both are aggressive planets.A trine means energy flows freely. So fire energy flows freely. This could lift the markets up again. In other words, it is like someone pushing up a falling ball.On 6th October, Mars forms another trine with Jupiter. Now as per Sayana calculations, Jupiter is in Leo. Leo is another fire sign. And Jupiter is an expansive generous planet. It also is a financial planet. So this could further fuel the market.At the same time Sun forms a square with Pluto and Mars forms a square with Chiron. Now these two aspects can be counter moving. In other words they could cool the market..that again happens in October first week. This is what I had mentioned as " ...current uptrend could see a spectacular rise and then reverse...". While this is happening, Mercury had had an encounter with Rahu..and soon Sun and Venus also will conjunct Rahu. Now these events will destabilise the planets and that will have an effect on the market.On 13th October, Sun will conjunct Rahu ( solar eclipse) and at the same time Moon will trine the conjunction and oppose Mars.Since this second event follows the first event of Mars Uranus Jupiter trine getting disturbed by Sun and Pluto, I expect the markets to temporarily top out in the first week of October. I say temporarily because I see a major top only in January 2015. Hope Iam clearer Alok. Problem is if I write all this, then it becomes too technical. As it is I think my blog is very technical and not useful for many people. wow... i dont know what more to say but am just in awe with your knowledge on planets and their affect on the financial mkts.